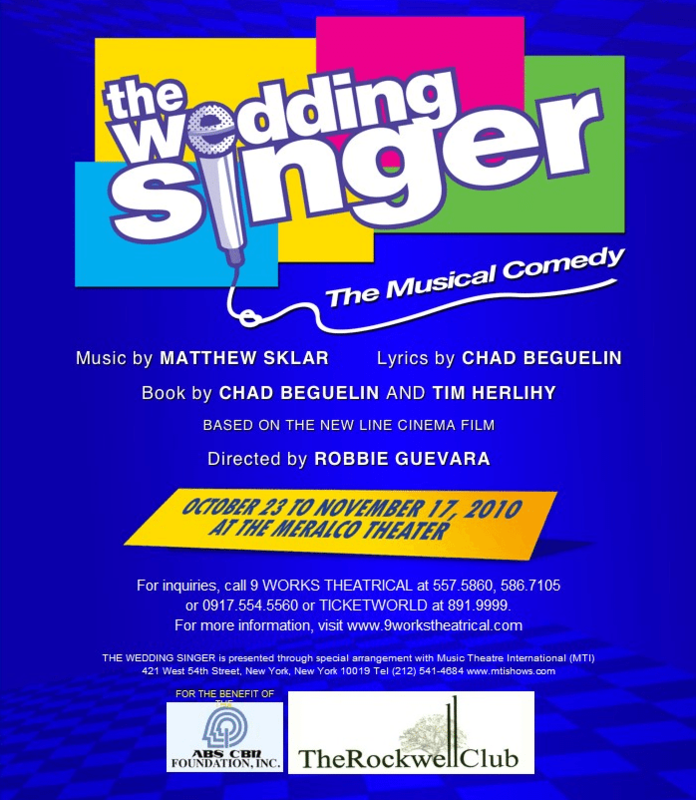 If you want to be truly entertained by the musical show, then you better watch out for the coming of The Wedding Singer Musical. If you are an 80’s baby, or you just simply love Adam Sandler, then I bet, the musical rings a bell. Yes, this theater show is based on the 80’s movie of Adam Sandler (Robbie Hart) with my favorite, Drew Barrymore (Julia). The Wedding Singer is written by Tim Herlihy and will feature the talents of Gian Magdangal who will play the role of Robbie and Iya Villana, alternating with the veteran theater artist, Shiela Valderrama-Martinez, as Julia. Nikki Valdez, Analin Bantug, Jeremy Aguado, Lorenz Martinez, Johann dela Fuente are among the actors who are also casted in the play. Robbie Guevara, will direct the musical-comedy play. The Wedding Singer, is a proud production of 9 Works Theatrical which will open its curtain soon on October 23, 2010. 8 p.m. at the Meralco Theater, Ortigas Avenue, Pasig City. This is brought to us by Rockwell Club, ABS-CBN Foundation, MAC Cosmetics, and The Philippine Star; presented through a special arrangement with Music Theatre International (MTI). Playdates are October 23, 24, 29, 30, 31, November 5, 6, 7, 13 and 14, 2010. Showtime: Friday, Saturday and Sunday shows at 8 p.m. with Saturday matinees at 3:30 p.m. and Sunday matinees at 4 p.m.
For more details, you may call 586.71.05, 557.58.60, 0917.554.5560, or visit www.9workstheatrical.com or call Ticketworld at 891.9999.
to the NOV. 5, Fri., 8pm show kindly contact MARK at 0917-5116645! visit..
.. for more details! thanks! Hi, do you know where I can buy tickets for the October 31 (Sun) playdate? Thanks! for Nov 7 Sunday 4pm show please contact 09287387473 or 09178171318. Thank you! you can view the available seats and reserve online. or you can contact Cla at 0917-8852526 or 0922-8351585. 🙂 see you on the 30th!